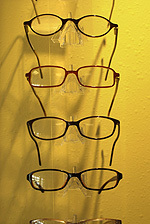 Sports glasses, Protective eyewear, Hunting glasses... we can help you with glasses for your specific needs. Custom One of a Kind Eye Jewelry! Let your imagination run wild! Custom, one of a kind eye wear available only from DEY Optical.